In the recent years, Ladakh remains a key market for both domestic and international tourist and it is seeing a steady rise in passengers from all over the world. In 2016, for the first time, the number of visitors in Ladakh exceeded 2 lakhs. Ladakh as a tourist destination has carved out a niche for itself among customers. In this issue, we have Tsering Angmo who is the Assistant Director Tourism, Leh. She took charge of the office on February 20, 2017. 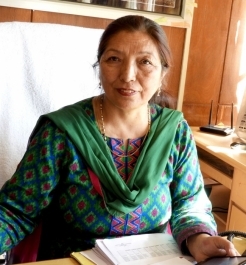 Earlier, in the year 2014-16, she was serving the Department of Industry and Commerce as a functional manager and also as the incharge General Manager. Throwing light on core areas of activities she said we have been seeing steady growth and are optimistic about keeping this momentum going. Q. What is the main function of Tourism Department and when it was established in Leh? The Department of Tourism is the main developmental, promotional and regulatory body of the Government of J&K. The main role is to plan and execute various schemes for the development, up gradation, and improvement of the tourism infrastructure in different parts of the region. It carries out travel trade shows to promote their destination and products both in the domestic and international market. It also regulates travel trade by enforcement of provisions of J&K registrations of Tourist Trade Act1978/1982. Under this act, all the tourist officers posted in different destinations have been empowered with special powers as prescribed authorities to register and regulate the tourist trade in their respective area of jurisdiction to look into complaints from tourists visiting the state. Another important role is to get the hotels, guest house and homestays registered. Department also provides the license to travel agencies, pony wala, camel safari wala and travel guides. Q. Can you share the data of visitors in Ladakh and in which year it has increased? Reason. The unique landscape and rich cultural resources of Ladakh attract tourist from all over the world in good numbers. Ladakh was first open for tourism in the year the year 1974 and since then the trend shows an increase in the number of visitors till 2017. In the year, 1974 the total number of tourist arrivals to the Ladakh region was 527 out of which 500 were foreign and 27 were the domestic tourist. In late 1980’s, the tourist arrival data reached 22,748 with around 16,000 tourists from foreign countries and around 6000 from different parts of India. Until 2010, the growth in tourist arrivals remained under 80,000 including 22,115 foreigners and 55,685 domestic. Ladakh became very popular after the release of ‘3 Idiots’, the famous Bollywood movie in which a part of the movie was shot at Pangong Lake and other parts of the region. The movie did a massive contribution in promoting Ladakh in the mainstream market. And in the year 2011, the number of tourist arrivals reached 1, 79,491. Out of the tota1, 42,829 were the domestic tourist and 36,662 foreigners. Since then the tourist influx is increasing every year. In the year 2016, we received 2, 35,698 tourists including 1, 97,693 domestic and 38,005 foreigners. So far in the year 2017, we have approximately 2, 28,642 tourist arrived in Ladakh region. Out of which 1, 87,661 are domestic and 40,981 foreigners. Q.The tourism industry is booming in Ladakh so what are the advantages and disadvantages? Tourism is booming in Ladakh and the fast pace of progress in past decades caused significant economic development including new avenues of income and employment. As we all know that tourism is the main industry in Ladakh providing jobs to the major portion of the population. It has a multiplier effect, which means the arrival of tourist will not only prove a boon to the hotelier, travel agents or cab drivers but also encourages the growth of the primary and secondary sector. For example, the increase in the arrival of tourist helps the vegetable seller, grocery and souvenir stores, dry cleaners etc. What I am trying to say is that it brings income to all segments of the population; it helps the development of infrastructure in the region that can be used by the locals as well as the tourist visiting Ladakh. Along with the positive impacts, we have major drawback also. One of the major concerns is the traffic congestion in and around Leh during the peak season and also the lack of parking space. Thousands of car and motorcycles enter and exit Leh town every day which creates a lot of problems for both the tourist and locals. The mushrooming hotels and guesthouse are turning Leh into a concrete jungle. There is a massive developmental activity, construction everywhere which is adversely affecting the culture and environment. Q. What kind of problems are we facing and how can we cope with that? The tourism industry is definitely developing the region in terms of income and employment but along with all the positive impacts, there are issues and problems which need serious attention. The environmental degradation, water scarcity, decrease in culture and moral values, lack of social responsibility among the people and rise of conflicts all are taking shape along with the development. Ladakh has a fragile ecosystem and the heavy influx of tourism is also causing a threat to the environment. Garbage has been increasing tremendously and we are not fully equipped with waste management and proper disposal. The rivers and streams are getting polluted and the adoption of flush toilet system massively and the maximum of the people have the bore well system which has lead to water scarcity. People are more into making easy money thus abandoning the age-old agriculture practice. The rich culture and tradition are losing its value as people are more into embracing new technology and modern lifestyle. Also, the market demand has made many entrepreneurs to explore more into this region to start their ventures, thus, causing conflicts and issues. To cope with all these problems we need to focus on environmental protection and preservation of cultural heritage along with tourism benefits by promoting responsible and quality tourism. Awareness is needed to expand the benefit of tourism equally to all the population in an environmentally sound and socially responsible manner. Q. Do we have any statistics of the carrying capacity of Leh? How much pressure are we putting on the resources as the inflow of tourist is four to five times higher than Leh’s population? So far, we don’t have any statistics of the carrying capacity of Leh, but with the rise of tourist influx every year we are definitely putting pressure on the resources which are already limited. Resources will definitely deplete if not used wisely and there is a need to think about it because things will not remain the same forever. Q. In 2016, for the first time the number of visitors have exceeded 2 Lakh, how important is it to regulate/ restrict the movement of tourist? Regulation/ restriction in the movement of tourist is needed to ensure the preservation of the environment and cultural resources and to make it sustainable and equitable sector. There is no tourism policy in Ladakh to check and control over the things related to tourism. Q. With the growing influx of tourism, do we have enough facilities to cater all those visitors? As compared to the growing influx of tourism we don’t have good infrastructure and facilities to cater all the visitors. For e.g we don’t have parking space resulting heavy traffic congestion in and around Leh during the peak season. The absence of waste management facility is causing a major threat to the environment. During the peak season, it becomes very difficult to accommodate because hotels and guest houses remain packed. But the good thing is that there are various destinations in far-flung areas which have the overnight stay facilities which help to accommodate on the rotational basis. Q. What are the viable solutions to make it sustainable? Do we have any policy or framework, so that tourism inflow can be regulated? We do have a policy framework on tourism for Leh district based on principles of Ecotourism. The concept is to promote responsible travel to an eco-system, developing an appreciation of the natural environment and cultural heritage and expanding the benefit to more and more people but in environmentally sound and socially responsible manner. The strategic objective of the policy is to ensure sustained inflow of quality tourism, equal distribution of income generated by the local population. The policy also aims to make an effective mechanism for environmental protection and preservation of rich ancient culture and its values. Q. People of Ladakh are shifting from subsistence agriculture towards tourism industry. Is this shift sustainable? Agriculture is the prime occupation which has been carried out from the time of our ancestors. It is not that we have totally shifted from it but because of the tourism industry and other opportunities, the trend of agriculture practice has definitely come down. Agricultural land is turning into commercial setups and construction sites. With all these developments, people are changing their lifestyle and embracing the new technology and trends which is leading to the decline in culture, tradition which is definitely not a sustainable development. There is a need to promote quality and rural tourism to promote the real culture and tradition. Also, awareness is needed to encourage people on organic farming and also agriculture sector needs to be developed. Q. What kind of conflicts and problem arises with the booming tourism industry that didn’t exist before? There are many issues and conflicts taking place in Ladakh because of the booming tourism industry and many are the incidents which have not existed before. In the year 2015, the strike against the private self-drive rental cars and bikes of tourist by the local taxi driver is one such example. The reason behind was that the entry of outside private cabs in the local taxi market has put the livelihood of the local drivers at stake and also the tourist in the name of visiting and admiring the beauty of Ladakh is creating havoc and destroying the fragile ecosystem of Ladakh. The incident reported went flooded on many online websites which have spoiled the image of Ladakh. The heavy influx of tourism is also causing disturbance to the wildlife. The commercial set up in far-flung areas, feeding of foods to the wildlife such as Marmots and the increase in the number of vehicles and the garbage generated has affected the fragile ecosystem. There are many instances of bike rentals issues, commercial setup issue in Pangong which are taking shape because of the tourism. Q. What kind of schemes is made available to the public by the Tourism department? Tourism incentives for the construction/expansion of Hotels, conversion of the residential house into Paying Guesthouse and for the generator set are there for the people who are interested to avail it. 1. Project Report duly prepared by a reputed architecture/chartered accountant duly approved by the Government. 2. Building plan indicating the front/ side elevation with local Shingtsag rooms and bathrooms as per the prescribed size. 3. Site plan indicating built up area not exceeding 40% of the total area. 4. Detailed estimates of the project. 6. Shajara/khasra of land duly signed by the Tehsildar. 7. Land ownership certificate from Tehsildar. 8. Land valuation certificate from Tehsildar duly countersigned by the District Collector. 9. Building permission from the Municipal Committee, Leh. 10. No Objection certificate from Executive Engineer, PHE division. 11. No Objection certificate from Executive Engineer, PDD. 12. Pollution clearance certificate from the State Pollution control board. 13. No Objection certificate from Fire and Emergency Service. 14. Feasibility certificate from Assistant Director Tourism, Leh. 1. Shajara/khasara of land duly signed by the Tehsildar. 2. Ownership of the property. 3. Site Plan duly countersigned by the Executive Engineer PWD of the area. 4. Building plan indicating the existing infrastructure and proposed expansion/extension/ remodeling and upgradation etc. 5. Detailed estimates for remodeling/expansion and Upgradation duly countersigned by the Executive Engineer PWD of the area. 6. General abstract of the estimates. 7. No Objection certificate from Executive Engineer, PHE division. 8. No Objection certificate from Executive Engineer, PDD. 6. Load assessment statement and No objection certificate from Executive Engineer, EM&RE division Choglamsar. We need to preserve and promote our tradition and culture to promote responsible tourism in order to make the industry sustainable.